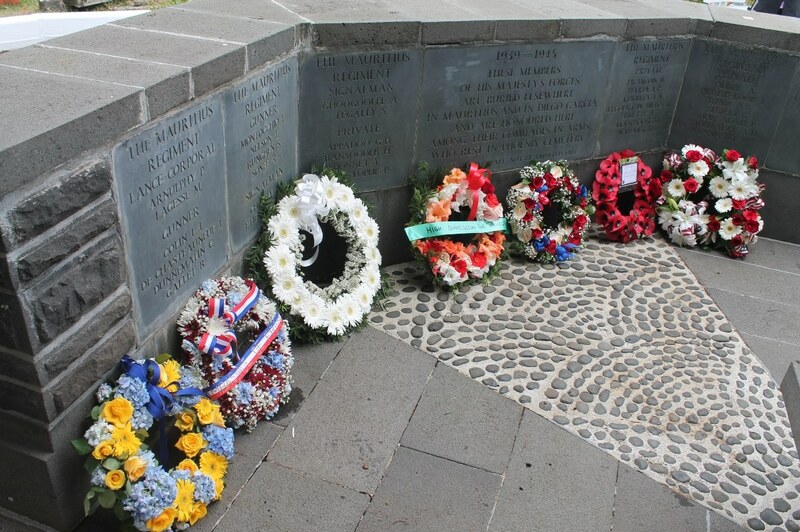 On Remembrance Sunday, 9 November the official ceremony was held at the monument in Curepipe. However, on Tuesday 11 November (Armistice Day) the British High Commission organised a wreath laying ceremony at the monument at Phoenix cemetery. This was well attended by Mauritius government representative, Diplomatic Corps representatives, the Mauritian Veterans delegation, the mayor of Vacoas-Phoenix Municipality. His Grace, the Anglican Archbishop, the Most Reverend Ian Ernest in his speech talked of the role of religion in the construction of peace and justice. After the speeches the Mauritius Police Band sounded the last post which was followed by a two-minute silence and completed by the band playing reveille. Next, the official representatives laid wreaths on the Phoenix Memorial. To complete the ceremony the attendees walked the few metres to the Commonwealth War Graves plot. There the officials laid wreaths on selected graves of military personnel from the first and second world wars. With thanks to the British High Commissioner, Mr Jonathan Drew MBE and staff for organising the memorial ceremony saluting the Commonwealth military that gave their lives for our freedom. Happy to report that Ambassador Shari Villarosa of the Embassy of the United States attended too and laid a wreath. Had the pleasure to meet this lovely lady. Previous Previous post: Phytomania or Kleptomania?